We care about the safety of our customers, that's why we've carefully designed this dip belt to keep you safe from injuries, as well as, give you excellent support. Reach new heights of power and strength as you train to develop your core, chest and arms. Our professional Dipping Belt has one of the strongest and longest stainless steel chains around. Thread the chain through any weight or kettlebell and clip it round your hips before you do your dips. You'll notice the difference in your arms and core, but you won't be distracted by the belt as it has an ergonomic tapered design that fits snugly and securely on your hips without pinching your skin. Durable yet flexible, this superior-comfort belt is built to last, and is guaranteed not to split, tear or break even when using weights as heavy as 250lbs. A great way to take your dips and pull ups to the next level, see improved results and feel more powerful. Fully adjustable - one size fits all. TAKE YOUR DIPS, PULL UPS AND CHIN UPS TO THE NEXT LEVEL If you've started to plateau in your workout, attaching a weight to your hips really helps you power up to achieve greater gains. Can also be used with a cable machine for squats or attach a kettlebell for hip rotation exercises. GUARANTEED UNBREAKABLE: This belt is built tough for your extreme workouts. Sturdy metal fixings, premium grade materials and double stitching mean this belt will never break or split in normal use. ONE OF THE STRONGEST CHAINS YOU CAN BUY: Don't worry about the chain snapping with its heavy duty stainless steel links & connectors you can hang weights as heavy as 250lbs to increase the load for bodyweight lifts. ULTRA COMFORTABLE: A tapered design sits comfortably and securely on your hips and doesn't pinch your skin, even with heavier loads. It remains stable through the full range of motion, so you can fully concentrate on your lifts while being safe and worry free of injuries. 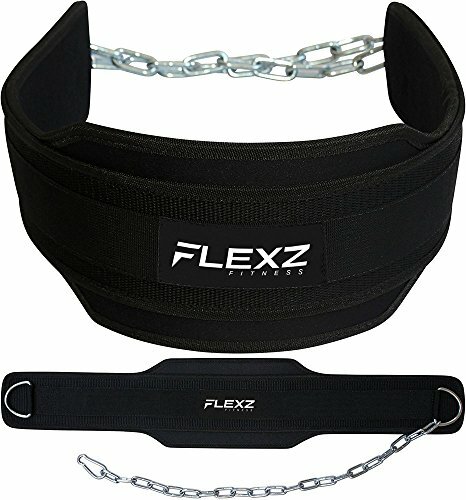 If you have any questions about this product by Flexz Fitness, contact us by completing and submitting the form below. If you are looking for a specif part number, please include it with your message.